at the Minnesota Landscape Arboretum. 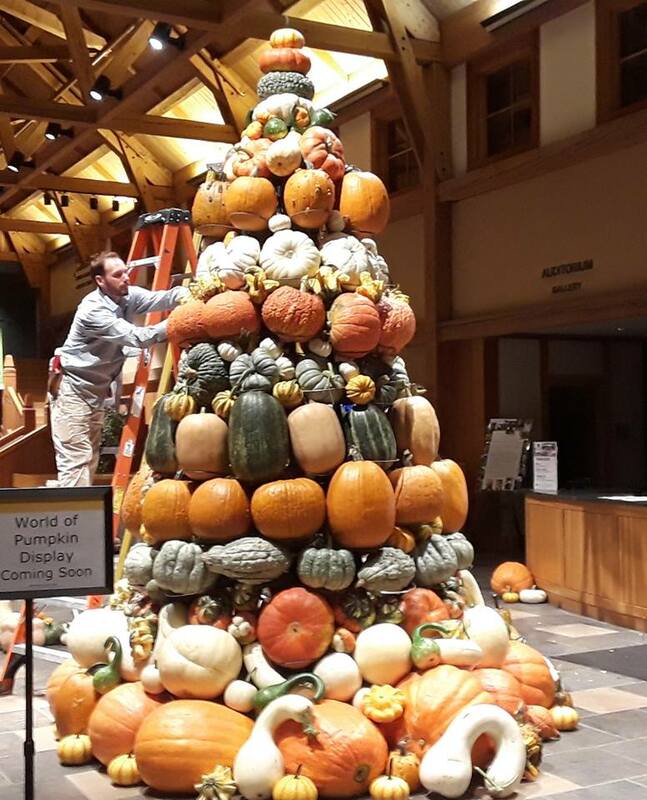 Somehow, while managing grape breeding trials at the UMN Horticultural Research Center, John and Jenny Thull find time to grow over 300 varieties of pumpkins, squash, and gourds for the Minnesota Landscape Arboretum every year. This year, they grew 330 varieties, 75% of which are heirlooms. They include specimens from every continent (except Antarctica), from countries like Thailand, Italy, France, China, Russia, and Japan. Out of those 330, 315 produced fruit. 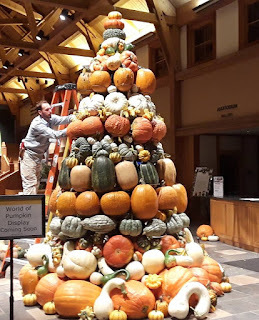 A major goal in their squash program is to promote unique, high quality varieties. This has gone over well with customers at the arboretum. Varieties they recommend to growers looking to branch out. Varieties increasing in popularity among customers. How they approach problem-solving and pest management. Speckled Hound: Highly productive hybrid with unique pink and blue patterning, excellent pie quality. Wolf: Large, reliable jack pumpkin with a huge handle. Good productivity and ease of growth. 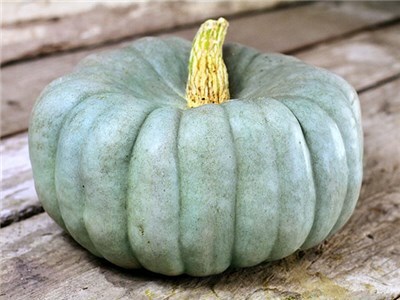 Jarrahdale: Blue flat pumpkin that is productive and easy to grow. 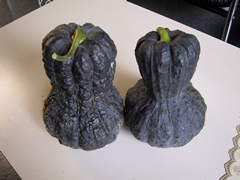 Red Warty Thing (Victor): Popular bright red squash with distinctive shape, covered in warts. Blaze and Spark: Newer varieties that have become quite popular. Consistent producers with a neat, compact shape. Orange and yellow striped and slightly flat. 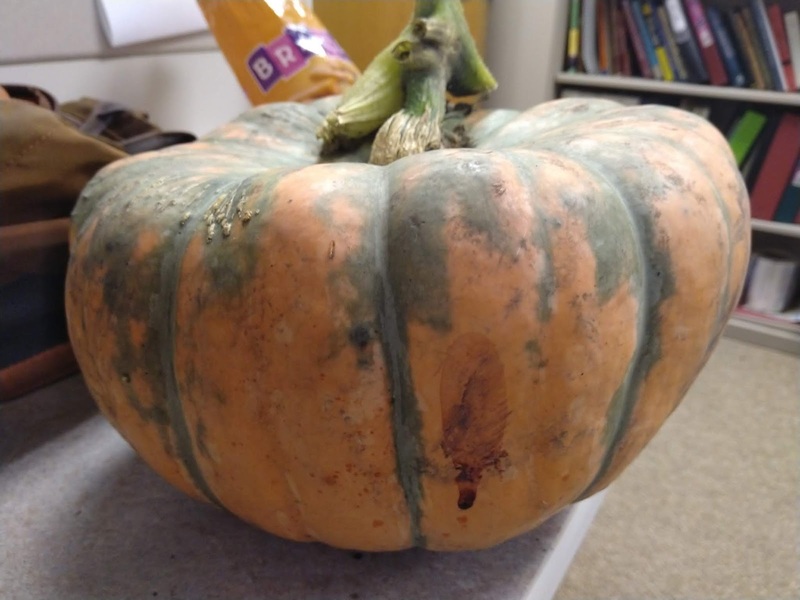 According to Jenny, more customers are asking for blue pumpkins, potentially in part to the Teal Pumpkin initiative to raise awareness for food allergies during trick-or-treating. Some varieties of pink and blue pumpkins include Marina di Chioggia (pink), Australian Butter (pink), Jarrahdale (blue), Queensland Blue, and Blue Doll. Some Japanese and Chinese varieties date back to the 1600s, and can be grown here in Minnesota. They include highly unique shapes and color patterns that are popular among arboretum customers. The Thulls have found them to have long storage periods, extending to February or March. Some popular varieties include Shishigatani, Yuxijianbinggua, and Chirimen. John and Jenny also compare a number of acorn squash varieties in search of the best flavor and texture. Some of their top picks include Honey Bear, Tuffy, and Honey Boat Delacata. Honey Bear and Tuffy have typical acorn squash shape and color, with excellent flesh quality and taste. While Honey Boat Delacata is more oblong than the typical acorn shape that customers are used to, they feel that the high culinary quality is worth giving this variety a try. In addition to acorn squash, they have also spent considerable time comparing culinary qualities of butternut squash varieties. They recommend growers try out Canesi, Butterscotch, Rogosa Violina, and Gioa for smooth flesh texture and complex flavors. Top challenges for the Thulls' variety trials include weeds and weather. All varieties are direct-seeded once temperatures are consistently warm in May or June to foster fast emergence time and early growth. Wet soil during germination can cause seed decay. If wet weather is forecast for the days following planting, the Thulls minimize the risk of decay by planting at a shallower depth. This helps ensure that the seeds are not sitting in deep, saturated soil where they can rot. They strive to maintain an herbicide-free weed management program. First, they establish a stale seedbed prior to planting, in order to minimize weeds present during seed germination. They make two passes with a spring tooth cultivator before planting, first a couple weeks before planting to stimulate weed emergence, and then again immediately before planting to kill the emerged weeds. After direct-seeding, row aisles are kept clear with one cultivator pass until the squash plants vine into the aisles. Mid- and late-season weed control is achieved by hand-pulling by staff and volunteers.